Jarmere Jenkins' phone lights up. It's an incoming call from his older brother Jermaine. "Hey man, how would you like to work with Serena Williams?" Jarmere - a former professional tennis player turned investment sales consultant, out of work and plotting his next career move - thought it was a joke. Fast forward 14 months and he is an integral part of Team Serena, the small network of colleagues and confidants helping one of the world's all-time greatest players compete for Grand Slam titles again - little over a year after she "almost died" giving birth. "On paper the specific role is hitting partner on court. But the gig is much more than that," he says. Employee, hitting partner, gym buddy, 'Mafia' opponent, friend - to name but a few. So, how has Jenkins ended up here? It is a tale of talent, unfulfilled promised, hard work, a devastating natural disaster, circumstance and fortune all rolled into one. Standing on the baseline, Jenkins was feeling nervous. Across the net was someone he considers to be a "superhero". "This was someone who I had grown up watching my whole life," he recalls of his first hitting session with 23-time Grand Slam champion Williams. "Coming from where I'm from, there are not many African Americans that play tennis, let alone make finals at Wimbledon or any other Grand Slam. "I was exceptionally nervous. But it was a good nervous. It was the first time she had hit a tennis ball in nine months and she wasn't missing a ball. "In fact, I missed more balls than her. And I had been training and getting ready for her." Jenkins - a 28-year-old from a small town in Georgia - must have done something right. More than a year later he is still a key member of the Williams' team. Being part of the 37-year-old's inner circle, enabling him to travel the world and work at the Grand Slams - particularly Wimbledon - is a "dream come true". But what happens if he has an off day in the hitting session? A day, which most tennis players have once in a while, where they can't find their rhythm. "I've had two bad days," he says. "That was due to the brutal heat I think - a year ago in Miami. I was super tired. "There is a certain expectation and standard that comes with being on court with Serena. "At the time she didn't say anything, I actually took it upon myself to apologise to her and she understood. I haven't let it happen since then." Former world number one and seven-time Grand Slam champion John McEnroe famously claimed Williams would struggle to be in the top 700 on the men's circuit. So what is it like for a man who was ranked inside the world's top 200 to play against her? 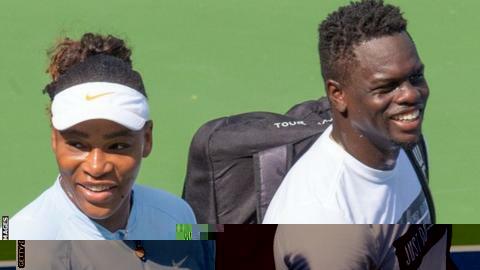 "The best way I can explain it is that I've been working with Serena for one year and two months, and not one time I've been on the tennis court with her have I felt comfortable," Jenkins says. "It is how she hits, how she moves. "I have never felt I could have a lazy practice with her. If I feel that way I can only imagine how the girls who play against her feel." From the day his dad Jackie found an old racquet in the garage and started playing tennis, it seemed inevitable Jarmere would follow suit. Tennis proved to be his path into the American college system, studying at the University of Virginia where he became the number one ranked college player in the United States. A successful graduation to the ATP Tour followed, where the highlights included climbing to a ranking of 190th and reaching the final qualifying rounds of the US Open and Australian Open. "Financially, it's tough as a player further down the Tour rankings, when you don't have sponsorship and not winning that many matches," he says. "I got injured at the 2014 US Open, from there I lost my contracts and the numbers weren't adding up. "I'd go to play tournaments and some tournaments I would win but the numbers were still negative. I'd still lose money. "Unless you are progressing up the ladder pretty fast, you're losing money. Maybe unless you are top 150 in the world." Tennis had been Jenkins' life. Suddenly, after deciding to quit the Tour in 2017, he found himself out of the sport he loves and looking for another job. That led him to Philadelphia, where he became a sales consultant for a multi-national investment company. "People would call me wanting to invest money and I would allocate their funds to certain mutual funds or exchange-traded funds," he says. "It was a rough transition for me to go from playing tennis all my life to all of a sudden now doing a nine-till-five job, having to do things by a certain time." After sticking that out for several months, Jenkins decided to leave the corporate world - "there wasn't enough creativity" - and move back into tennis. So he moved to Puerto Rico to teach tennis to children, only for another intervention - this time from Mother Nature - to change the course of his life. Hurricane Maria killed almost 3,000 people on the north Caribbean island, with Jenkins able to escape danger as around 130,000 people were forced to leave. Although upset at the destruction left behind on the island, his return to the States turned out to be "perfect timing" in professional terms. It was September 2017 and that was when he took the call from Jermaine, who was then the hitting partner of Serena's older sister Venus. That connection meant Jarmere had already crossed paths with Serena on "a handful" of previous occasions and, after instantly accepting the offer, he flew out to the academy of Serena's coach Patrick Mouratoglou in France. After a week's training, Mouratoglou decided Jenkins was the right fit. "From there I went back to Florida, met with Serena and we developed a good relationship. And I've been working with her since," Jenkins says. "I feel honoured to be able to work with one of the greatest athletes of all time, not just one of the greatest tennis players of all time." Spending blocks of weeks together at tournaments and travelling around the world on the circuit means being part of Team Serena is a full-on job that requires undivided attention. So, what is she like to work with? Is she always serious? A workaholic? Fun? "A little bit of it all," Jenkins says. "You watch her on TV and for me it is like seeing how magic works first hand. "Growing up I have always looked at her as this superhero - and I still do. But now I also look at her like a big sister/mentor/boss. "To see that fire she has in her eyes when she's playing in the Grand Slam finals - the same fire she has in her eyes when we are practising - is amazing. "There is a tonne of work ethic that goes into being Serena - it just doesn't happen overnight." But it is not all work. Like all teams working away together, there have to be moments when they all switch off. And in Team Serena that often centres around 'Mafia' - a card game that pitches the informed minority (the Mafia) against the uninformed majority (the Innocents). "You have a narrator, a police officer, a nurse and the whole game you're trying to guess the Mafia. I'm always the Mafia and I always win," Jenkins says. "I'm the biggest competitor you'll ever see. Serena will never admit it but I'm a better card/board game player than her."